Home How It Works Why Buy Reviews Buy Now ! Snoring happens when asleep because the jaw muscles go slack, so the jaw (and the attached tongue) fall back, narrowing the airway. How does the SnoreMender stop snoring? The SnoreMender is worn at night, like a small soft flexible gumshield. It holds the jaw slightly forwards, preventing the jaw and tongue from falling back, to keep the airway open and stop snoring. 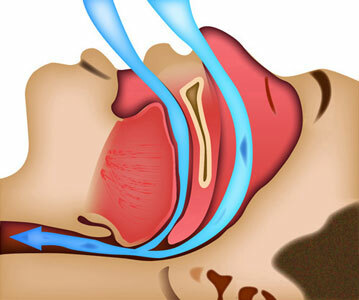 The SnoreMender allows normal breathing and the mouth to open and close naturally while sleeping. To use, simply put the SnoreMender in the mouth before going to sleep. The moulded upper and lower trays fit over the teeth and the hinged SnoreMender allows full movement while preventing the jaw from falling back while asleep, even if lying on your back. Apart from a few days of adjustment when first used, SnoreMender is probably the most comfortable practical solution you will ever find. From the first time used, you and your partner will get the huge benefits of a good night's sleep together. Even the snorer gets a better sleep, as the snoring can often disturb their own sleep! Comfort is probably the biggest concern that a new user has and the idea of having something in your mouth for a whole night is disconcerting. How do we allay this concern? Through personal references and the fact that Sleep Well Enjoy Life Ltd's principal was a SnoreMender user long before bringing SnoreMender to the USA. "I received the SnoreMender on June 25. Very quick service. And even better, it works. I never would have believed such a simple device could stop my long time snoring. I was thoroughly prepared for it to be another expensive throw away. I even recorded myself with and without the SnoreMender to be sure it worked. The result was very loud snoring without - absolute silence with. It is fairly uncomfortable for the first few days, but after that, no problem at all. Thanks. I'll be ordering more and have friends and family interested, too." * SnoreMender® addresses simple snoring and some may still experience snoring due to other conditions. Caution: Federal law restricts this device to sale by or on the order of a dentist or physician.